NEW YORK CITY, June 22, 2017 – The 2017/18 GFNY World season begins this weekend with the third edition of GFNY Mont Ventoux. A total of 15 GFNY World races are lined up for the largest Global Cycling Marathon Brand. They include the Campagnolo GFNY World Championship in NYC and regional championships in Asia, Europe, Latin America and a brand new regional championship in the Middle East – Africa. All GFNY World events offer participants the established, trusted GFNY experience complemented with each location’s local flair. The 2017/18 season starts this weekend with the GFNY Europe Championship at Mont Ventoux, France. 35 countries will represent at one of the world’s most iconic cycling stages in the world tackling three famous cols before the ultimate attack and finish atop Mont Ventoux. The season then moves to Conservatoria, Brazil (2 hours from Rio De Janerio) for the inaugural GFNY Brasil on August 6. A month later, GFNY heads back to Germany for the second edition of GFNY Deutschland in Hamelin on September 3. Throughout the course riders can enjoy fully closed-to-traffic roads and a popular post race ‘recovery’ beer, sausage and fries. On the same day, the exotic island of Lombok, Indonesia will host the second annual GFNY Indonesia and the GFNY Asia Championship. Riders will take on 180km over 2054m of climbing in humid conditions with one climb that tops out at 25%. Brand new to the season, Provence in France will host a three-day stage race from September 30 to October 1. 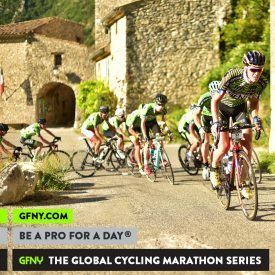 GFNY Provence Day 2 includes the assault on the famed Mont Ventoux (135km, 2480m), for a total of 3 breathtaking stages over cols and through charming historic Provencal villages. 3000 riders are registered for GFNY Cozumel as it returns for its fourth edition on November 12. White sandy beaches and ocean views throughout, Cozumel is a cycling marathon in paradise. 2017 ends with the inaugural GFNY Chile in South America on November 26. The race will be held in Casablanca, one of Chile’s great wine regions, located an hour from Santiago. GFNY World returns to Indonesia, this time to the popular island of Bali for the first race of 2018 and the inaugural GFNY Bali on February 4. Next up is Mexico, where Monterrey hosts the 2018 GFNY Latin American Championship on February 25. The race course travels through the heart of the city as well as the spectacular Parque Ecológico Chipinque. The fourth annual GFNY Colombia takes place on March 11. Located just outside Bogota, it is one of the toughest challenges on the GFNY World calendar with its finish atop the 3362m-high La Cuchilla de Guasca. One week later GFNY World moves to South America’s Saint Tropez, Punta Del Este. The third edition of GFNY Uruguay on March 18 is the country’s only mass participation bike race. The inaugural GFNY Costa Rica takes place on April 22 and will be held in La Fortuna, the adventure center of Costa Rica. The race course that will take riders alongside the majestic Arenal Volcano and Lake Arenal. GFNY World then heads to Israel and the historic city of Jerusalem for the inaugural GFNY Middle East – African Championship, GFNY Jerusalem on April 27. Starting out from the magical gates of the old city of Jerusalem, the course will take riders alongside famous sights, overlooking the Dead Sea and Jordan from the Jerusalem hills. Riders will finish in the Jerusalem Arena. GFNY returns to South East Asia and Ipoh for the second edition of the hot and humid GFNY Malaysia on April 29. The season ends back in New York City for the eighth annual Campagnolo GFNY World Championship NYC on May 20. 5000 riders from almost 100 countries will compete for the crown. Colombian Camila Cortes and Italian Ricardo Pichetta are set to defend their 2017 titles. Iconic, official, neon green GFNY race jersey, which has become a sought-after badge of honor.